Searching for your pattern : You can search either in store via catalogues or online via the pattern company websites. I prefer to use the catalogues as you can gain more information from them and I find it easier to compare patterns to one another if I can see the actual product. Most stores that sell patterns have a variety of books to choose from, for instance at Sew Crafty we have New Look, Simplicity and McCalls patterns in stock and have Vogue and Butterick catalogues with the patterns to order. Usually you will search through the catalogues to find the design you like, then the sales assistant will find the pattern envelope in the stock drawers for you in the size that you need. Sizing : Check that the pattern is available in your size. We find that patterns come up at least one size smaller than you would buy in say Marks and Spencer's or Topshop. 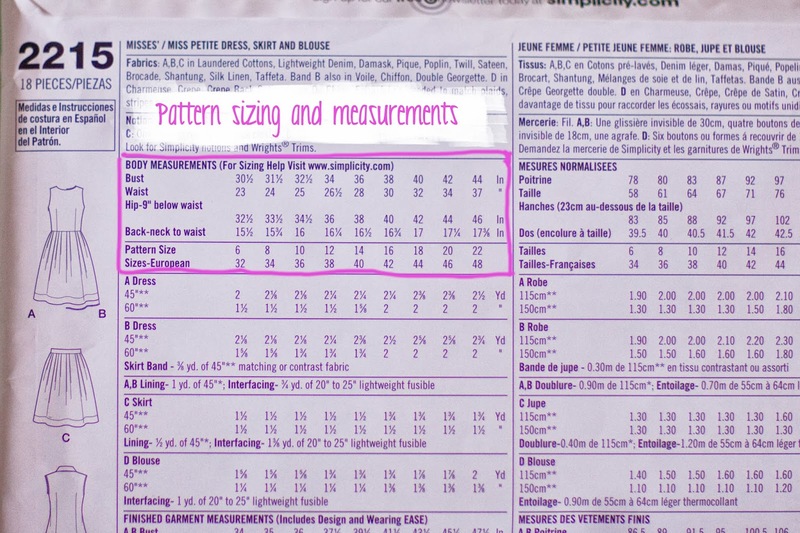 You can check your measurements for sizing in the back of the catalogues for a general guide, and specific sizing on the pattern itself. A good general rule to follow is that if you usually buy a size 12 in a ready made garment you will be best making a size 14 in a pattern. Luckily most patterns come in multi sized groupings, for instance (8-14) - (14-24) so you can be a little flexible. Be aware that the back of the pattern envelope will give you details for all the sizes, only the front will tell you the grouping you are buying. 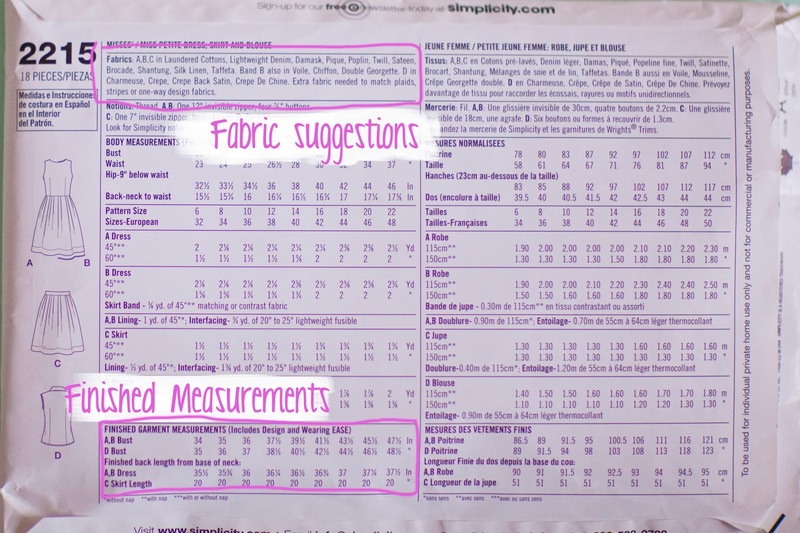 Measurements : The other thing that can be helpful when looking at size is taking your measurements before you go to look for patterns. Knowing your measurements in inches and cm is helpful when trying to choose a pattern. The garment measurements and size measurements are usually listed on the back of the pattern envelope (if not they will be on the instructions) and will give you a good indication of the size and length of the finished garment. This will let you know what the fit of the garment is like too, whether it is designed to be a tight fit, or a loose baggy garment, how full the skirt will be etc. Fabric : If you want a pattern to make a cotton dress, picking a design that is shown in thick wool is not going to work very well. Try and be guided by the fabric suggestions on the pattern envelope. Style : When shopping for clothes we try and choose styles that suit our figures, do the same with patterns. You will never get a good result if you pick a style that is not what you would usually wear. Over ambitious : Try to pick a pattern that is relevant to your experience. If you choose a pattern that has lots of pieces and detailed seams, as a beginner, it can be too complicated and will end up being frustrating. Work your way up to details like pin tucks, detailed seams, intricate collars and sleeves. If you learn a different technique every time you try a pattern you will get a better result than trying to learn everything at once. Catalogue drawings : Don't let the drawings or photographs in the catalogues put you off. I try to look at the small line drawings at the bottom of each page to get an idea of shape, rather than being put off by a fabric choice or an exaggerated illustration. This is Part 1 of 3 the next section which will explain more about the pattern envelope and what all that information is for. Parts two and three are now available to view, Part 2 here and Part 3 here. If you liked this post and like our blog, please pop over and vote for us in this years blog awards. Really helpful, looking forward to the next part. Thank you! Glad it was helpful, Pt2 will be up next Saturday. Thanks Rhiannon, They can be very daunting, but don't need to be. they just contain a lot of information, not all needed every time you use one. The more you know and understand them the better results you can get.